Life Events. Are you searching for a Messianic Mohel or Rabbi, to assist you in observing the commandment of Genesis 17:10 and Leviticus 12:3, where we are instructed to circumcise our sons on the 08th day? Is your intention to consecrate (dedicate) your firstborn child to the Lord, as told in Exodus 13:2, and or present your subsequent children as blessed fruits of the womb, in the spirit of Deuteronomy 28:4? Have your children grown in their spiritual maturity, with your sons aspiring to bar mitzvah at 13 and your daughters aiming for bat mitzvah at 12 (see a modified BM video), reaching that Proverbs 2:1-5 understanding of God and ready to apply it, as did Messiah in Luke 2:41-47? And with roots that reach back to the first union our Lord Ordained in Genesis 2:18, is there a person to which you would like to be joined or renewed, becoming a Mark 10:9 one flesh? (see a Messianic Vow Renewal). Finally, on that day where our time on this earth comes to an end, there is a time to be born, and a time to die; a time to plant, and a time to pluck what is planted (Ecclesiastes 3:2). So grant us permission to say your kaddish and invite Messiah Echad, to all of your life events. Purim. Would you prefer that your children participate in biblically based holidays, vice those with no ties to the scriptures? When your kids dress up, do you prefer them to represent biblical or positive characters, especially if they are to be “rewarded” with candy? Have you ever heard of Purim and the story of Esther? Every year at Messiah Echad, Jewish, Christian and Non Religious Believers come together for Purim, where we unite our children around the Bible. See our 2014 Purim Video. Yes, there is also candy, dressing up and plays or skits, which might not have direct links to the scriptures, but it sure is more kosher than the alternatives. So we look forward to seeing you during this big celebration! As we will be commemorating Esther’s Dinner Banquet, light hors d’oeuvres will be served, along with wine (in moderation). Please come in biblical costume, kosher attire, or fancy dress. Pesach To Shavuot. Have you wondered about the last supper, and whether the last meal of our Messiah (ref. Mathew 26:17), was a Passover Seder? Do you live near Austin, Georgetown or Killeen, and would like to observe Pesach in the traditional manner but in an environment where you can ask questions about its connection with Messiah? Are you confused on how Messiah died on “Good Friday” yet arose three days and three nights later, on “Easter Sunday”? Are you planning on attending a full immersion, spring mikvah (baptism), modeled after Psalms 51:2-4, Isaiah 1:16-18 or Mathew 3:15-17, which is for those who are new to faith and or want to prepare for Pesach? Do you know what happened on Shavuot (Pentecost), roughly 50 days after Pesach? And in between Pesach and Shavuot, are you familiar with the Feast of Unleavened Bread and First Fruits? 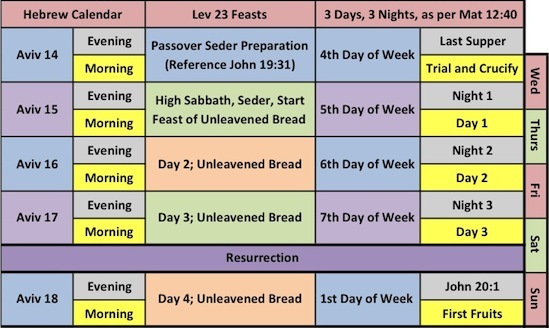 A lot going on but Messiah Echad will help teach on these feasts, explain the resurrection calendar, conduct passover seders and host demonstrations, so join us! You can also watch our Passover and Shavuot Videos, which will better explain the festivities, provide insight into the traditions, and show how we keep the children engaged (like acting out the plagues). As for costs, our members continue to enable events to be offered free of charge, but please consider a special donation for the festivities, as we project costs to be around $20 per individual, or about $65 for families of four or more. Lastly, be sure to review the Messiah Echad Messianic Haggadah. Passover 2019 will be on Friday, 19 April at 07-09pm, 375 County Road 245, Georgetown TX 78633. Please RSVP to The Office. High Holy Days. Do you desire to keep the Feast of Tabernacles or Sukkot, just as our Messiah did in John 7:2? For Feast of Trumpets or Rosh Hashanah*, are you familiar with The Tashlich Service, derived from Micah 7:19, where we sound the shofar, symbolically cast away our sins, and mark one of the four biblical new years (kings, fruits, trees, *creation)? Would you like to participate in our bread/wine service(s), where we accept salvation by doing I Corithians 11:23-28, during Tashlich and on Yom Kippur. And about that Day of Atonement or Yom Kippur… have you a desire to attend our full immersion, fall mikvah (baptism), modeled after Psalms 51:2-4, 7a (purge with water and hyssop), Isaiah 1:16-18 (for new believers) and Mathew 3:15-17 (for seasoned believers), after which we afflict our souls and repent for our wrongs? Messiah Echad will be observing the High Holy Days from Leviticus 23:23-43 by blowing trumpets and casting bread at a nearby river (Rosh Hashanah), immersing ourselves in mikvah (baptism), lighting candles then making “Al Chet” confessions after which we accept the atonement of Messiah (Yom Kippur), and feasting in temporary dwellings (Sukkot) – which we do Comfort Camping Style! As for costs, our members continue to enable events to be offered free of charge, but please consider a special donation for the festivities, as we project costs to be around $90 per individual, or about $300 for families of four or more. And of course everything ends with the Eight Day (Shemini Atzeret) and completing the Torah Cycle (Simchat Torah)… Be sure to watch our High Holy Day Video, greet each other with (La) Shanah Tovah and get your hands on some apples with honey. Meeting at Chandler Park (106 Spring Valley Rd, Georgetown, TX 78628). Meeting at Messiah Echad (505 W. University Ave. #109, Georgetown TX 78626). Meeting at The Blue Hole (100 South Rock Street, Georgetown TX 78626). Weather permitting and yes, all are welcome, but please ccontact an Elder, in regards to requirements. Meeting at Messiah Echad (505 W. University Ave. #109, Georgetown TX 78626), for a solemn service. As your body is able, and spirit willing, consider starting a 25hr drink, food, and marital relations fast. Camping at Jim Hogg Park (500 Jim Hogg Rd, Georgetown, TX 78633), on Lake Georgetown. Provided – Campsite Fees, Bathrooms and Showers (125 yards walk), Biblically Based Teachings (09am and 06pm each day), Grills (charcoal provided), Electricity, HEB Grocery Store (6min drive), RV Hookups, Light Snacks, Tents (must RSVP), and Water. NOT Provided (please bring) – Bedding (i.e. sleeping bag, cots, air mattress), Chairs, Extension Cords or Power Strips, Flashlight, Games, Insect Repellent, Meals, Recreation (i.e. Ring Toss), Swimming Attire, Sunscreen, Toiletries, and Water Activities. Chanukah. Is that section in Jeremiah 10:1-5 leading you away from holiday tree worship, and giving you a desire to enjoy biblically inspired traditions? Or maybe you have a child like humility and belief in miracles… not the one on 31st Street but the one where one day worth of oil, burned for eight days straight? And do you agree that a portly guy named Nicholas, his Frosty companion and a red nosed sidekick would be no match for an emperor defeating Mattathias and his son Judah Maccabee? Well, you are not alone and Messiah Echad would love to share some dreidel spinning, latke eating and gelt exchanging good times. So watch our video, bring your nine candle chanukiah or the more accurate seven candle menorah (to the Chanukah Erev Shabbat Party), fry up some treats and grab all the coin shaped chocolates you can get your hands on… we are going to have a great time! We also, often, have special guests such as the Governor, Mayor, or Police Chief in attendance… check out our press releases page sometime! So granted, we are not specifically commanded in the torah to celebrate this season, it still can be the most; wonderful time… of the year. Georgetown Chanukah Lighting (30 Minutes before sunset). Candle Lighting Each Night 05-06pm, Sunday 02 December – Sunday 09 December, 2018. Chanukah Party at Thundercloud Subs (814 S Main Street, 78626), Saturday 08 December, 05:30pm. Meeting at Preservation Georgetown (811 South Main Street, Georgetown, TX 78626). Please bring warm clothes, as we plan to sing, pray and light the menorah outside, in the Georgetown Square, then enjoy local restaurants and shops! Reaching Into The Community. In the final days, we know “it shall come to pass, that whoever calls on the name of Yahweh (Our Lord), shall be saved. For in Mount Zion and in Jerusalem there shall be deliverance, as Adonai has said, among the remnant whom Adonai calls… and on My menservants and on My maidservants, I will pour out My Ruach in those days” (Joel 2:28-29)… so we being many, “are gathered together in Ha’Shem, (knowing He is here) in the midst…” (Mathew 18:20), building our communities.